Historically, gun laws have typically been a Second Amendment issue. However, due to our growing technological age, gun production and gun ownership have shifted from a freedom of possession issue to a freedom of speech issue. In the wake of mass shootings, felt at a nationwide level, the issue is at the forefront of controversy amongst citizens and lawmakers. Three-dimensional/3D printers are a new player in the world firearms. 3D printing uses digital models generated by computers to create objects ranging from forks to functioning clocks. The printer follows the shape of the generated model and stacks layers of plastic to produce the desired object. Commonly, these products are assembled from ABS plastic parts, the same material used in Legos. In 2013, Cody Wilson, founder of Defense Distributed, posted blueprints for a printable plastic gun, called “Liberator”, to his website. Supporters of the release argued that being able to build untraceable and unregulated guns would make it harder for the government to ban them. The blueprints posted included an AR-15-style rifle, a Beretta M9 handgun, and other various firearms. Printed guns do not comply with any of the typical gun regulations, such as serial numbers, background checks, or licensing requirements. Shortly after posting the blueprints in 2013, the U.S. State Department sent Wilson a cease-and-desist letter demanding the removal of the blueprints from his website. The State Department stated that Wilson’s organization violated International Traffic in Arms Regulations (ITAR) by publishing its designs online. The State Department reasoned that the violation occurred due to the lack of borders on the internet. Subsequently, lawmakers extended a federal law for another 10 years requiring that all guns be detectable by metal screening machines. 3D printed gun designs contain a removable metal block which is not necessary for the functionality of the firearm. This feature allowed the regulations to be avoided. With the exception of the firing pin, these guns could potentially pass through TSA checkpoints or other large venue security stops undetectable. In 2015, Wilson sued the federal government, mounting his claim, not on the Second Amendment, but rather the First. He argued that his blueprints fell within the First Amendment’s protection of free speech and that posting and downloading from the internet fell within those rights. The Department of Justice suggested that the Government settle the case because the government would likely lose in court based on First Amendment grounds. 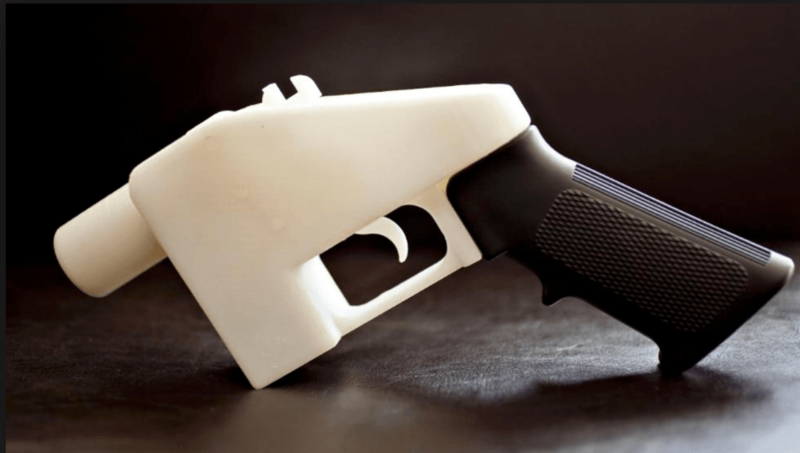 After settling, the State Department agreed to waive its restraining order and allowed Wilson and Defense Distributed to freely publish designs and other technical files about 3D gun printing. So where does that leave us now? Eight states, including Massachusetts, New York and the District of Columbia, filed lawsuits to block the online distribution after the State Department settlement. Massachusetts Attorney General Maura Healey argued that the distribution was an imminent threat to public safety and that there is a responsibility to ensure that the files are not made easily available to the public. In August 2018, the federal courts barred Wilson from giving his plans away for free. In response, Wilson began selling the blueprints in order to elude the court order. In a statement, Wilson stated, “I’m happy now to become the iTunes of downloadable guns if I can’t be the Napster.” Customers are welcomed to set their own prices for the downloads ranging from one penny to ten dollars. Wilson’s main issue: whether the government should have the ability to tell you what you can or cannot have, or can and can’t download online. The hostility between Defense Distributed and the government will likely continue along the same trajectory. However, if by selling the blueprints instead of making them available for free, the organization is attempting to skirt the issue, it will more likely than not end up back in court for further litigation and interpretation of the First Amendment. Student Bio: Sara Wilbraham is a 2L at Suffolk University Law School. She graduated from Quinnipiac University with a BA in Business Marketing.